- Hospital authorities will take your X-ray and will perform some tests like blood, urine and stool. Once you finished your medical test from the approved hospital or medical center, you should check the status of your medical report online through Ministry of Health portal or through Efada portal, In order to process your or your family's iqama. 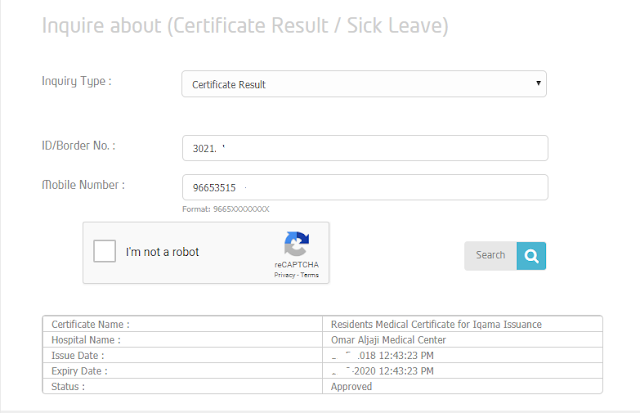 - Hospital authorities will update your medical report online, You can check the report online only after collecting your report. For checking your medical report online you should go through any of the two mentioned links. - Border number is available on your passport beside your entry stamp, it is written by hand in Arabic.